The award-winning sequel to the acclaimed memoir Hoi Polloi. ‘The dynasty has started with my father as the founding father and me his only son, the founding son. He looks forward to the day when he can watch his grandchildren out there in the clover-covered paddocks frolicking among the cowpats. Playing with a pony, getting stung by bees. The most wholesome activities in the world.’ With their only son on the brink of adolescence, the nouveaux-riches Sherbornes move away from the city to start a new, gentrified existence on a 300-acre farm - or ‘estate’ - in Taonga, New Zealand. But life on the farm is anything but wholesome. Sherborne evokes his family’s slide into madness through a series of unforgettable, hilarious portraits- of ‘Feet,’ his once-glamorous mother, now addled with snobbery, paranoia, and mental illness; of ‘The Duke,’ his uncomprehending, sporadically violent father; and of himself, the ‘Lord Muck’ of the title, at once helpless victim and ruthless agent of their undoing, who in the end must decide whether he can save his family. 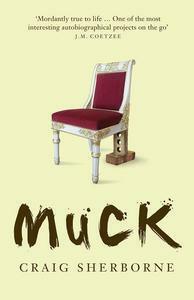 Clear-sighted, lyrical, and marvellously funny, Muck is a heart-rending memoir of family discord and an exquisite story of a young artist in search of a self.